Thinking of baying a kitten or breed on your Queen, then here is somethings you should know and think about before you bay one! Do not even think of breeding from your cat unless you know you can find home for the resulting litter. Ensure your breeding female has emotional as well as physical maturity. Coming into season is "natural" but not for a female that spends her life indoors, unable to induce ovulation by mating. Good nourishment is necessary for the development of kittens. Offer a balanced diet to the mother while she is pregnant and during her period of milk production. Feral toms are excellent breeders but are the likeliest carriers of feline immunodeficiency virus (FIV) and feline leukemia virus (FeLV). *Kittens benefit from being raised by a mother that is emotionally competent, never breed from young females who have not reached emotional maturity. *Allow kittens to continue to suckle to 12 weeks of age, for proper social development. *Think of how the kitten will live as an adult. Introduce different species early in life. *Do not be surprised if your cat occasionally lashes out while you pet it. This response is known as "petting aggression". Touch is a natural part of dependency but unnatural in the evolution of an adult lone hunter. *It stimulates physical dexterity and mental flexibility. *It permits experimentation under safe conditions. 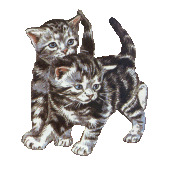 *It teaches a kitten how to carry out sequences of events. *It can become a lifelong activity in cats. The following suggestions will help you to overcome your natural reluctance to be groomed by you. Introduce grooming to a kitten while it is still with its mother. Start with short session, working up to longer session. Watch you cats body language. Tail lashing means you cat has had enough. Give rewards for good behaviour, they are well deserved. The cat is naturally independent but, through our intervention, it learns to rely upon us for the comfort of life, food, warmth, and protection. It looks upon its owner as a mother- substitute. When training your feline companion, try to think like a cat. Understand its inherent desire to hunt, mark its domain, and defend its territory from other cats. The urban outdoors is fraught with dangers, especially traffic, but life indoors is tedious, driving some cats to create their own mental stimulation. Prevent behavioural problems by anticipating your cats needs. Teach it how to cope with life with us. *Provide mental and physical stimulation through play and toys. *Play constructively and give food rewards immediately when appropriate. *Always use social deprivation, not physical abuse, as discipline. *Anticipate natural needs by providing "cat-only" rest sites. *Accept that cats live in a three dimensional world. Create three dimensional activities and games. *Using claws is natural, do not remove them! "Cats need to do certain things. Our obligation is to train them to channel their behaviours in directions they enjoy and we find acceptable." *Train it to miaow and come to you on command. *Provide all necessary amenities in your garden. *Introduce it to the outdoors when it is hungry and wants to return home for food. *Do not force an outdoor life on a cat afraid of it. *Prevent access to roads. Traffic kills more cats then any other cause. *Vaccinate your cat against infectious cat diseases. *Ensure your cat wears suitable, safe identification. *Because cats can slip their collars, they should carry two forms of ID. *Use a safe collar with a breakaway section. *Use effective means to control infectious disease and parasites. *Be considerate to the needs of your neighbours. Never give any food or nutrient in excess. For example, a diet restricted to tinned tuna may cause severe liver problems. Muscle meat alone, without the naturally accompanying organs, bones, and fur is deficient in some essential nutrients and may lead to decalcification of the bones, chronic pain, and eventual death.